This new Android on PC from Motorola is called CloudBB but it also portrays a more obscure model designation, the HMC3260. Motorola describes their first Android on PC product as a “home entertainment terminal” which frankly sounds like there is not that much power punch behind it. Their intended market might confirm that this first Android on PC from Motorola might prove rather bland: The CloudBB is available only on China. It is marketed as a very able video and audio streaming client. We think that this Android based computer must first be tested and benchmarked before accepting this as even practical, given the single core processor and the rather oldish Android 2.3.4 included included in the specs that Motorola includes on their web. This nifty machine is certainly reminiscent of an Apple desktop computer. The LCD monitor is 18.5 inches while being rated at a -rather low- resolution of 1366 x 768 pixels. The monitor also includes all the necessary hardware for the computer side, enabling it to run Android 2.3.4 Gingerbread. 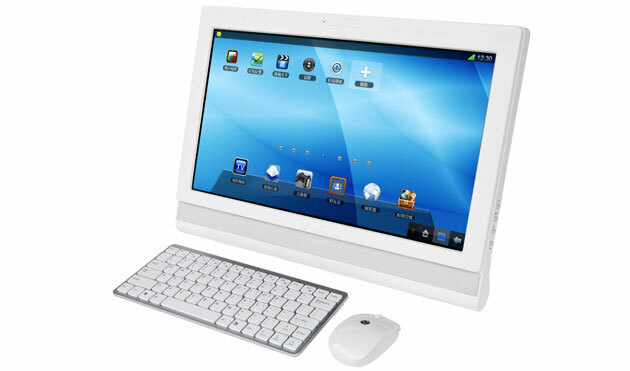 A Mouse and a very small chiclet-like keyboard are included, just as an “All in One PC”. On the processor side, this Android on PC is powered by a Freescale i.MX53 ARM Cortex A8 running at 1Ghz. There is 1 Gygabyte of ram included and a 4gb flash memory available to store your favorite Apps and games.Motorola’s Android on PC also includes an ethernet connector, suitable for PPPoE and LAN connections.